MSU GT hatches are manufactured for areas which require odour control, interior and landfill applications. MSU offers gas tight hatches in aluminum and stainless steel, types 304 and 316. They are designed to be cast into place in areas where gas-tightness and odour control is important. Originally developed for a regional landfill’s methane capture program, they are designed for pedestrian traffic. Reinforced for 7.2 kPa live load for angle frame or 14.4 kPa. 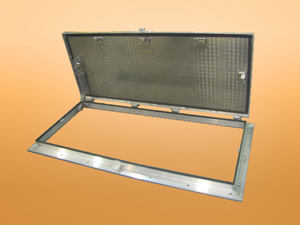 MSU GT hatches are manufactured in single, double and parallel-door units.